To reward your hard work, Honda would like to offer you $500 toward any new 2018 or new model year Honda automobile when you finance or lease with Honda Financial Services® (HFS). • Have graduated within the past two years or will graduate within the next six months with a master’s, bachelor’s or associate’s degree from a U.S.-accredited college or registered nursing school. • Meet HFS credit criteria and sign an HFS retail finance, Honda Leadership Leasing® or Honda Leadership Purchase Plan® (“balloon” ) contract. • Provide your Honda dealer with a copy of a diploma or college transcripts as proof of graduation eligibility and all other documents required by HFS. • Bonus recipient must be listed on the HFS contract as the primary buyer. • Meet HFS credit criteria and sign an HFS retail finance, Honda Leadership Leasing® or Honda Leadership Purchase Plan® ("balloon" ) contract. • No adverse credit history. • Proof of employment or a firm commitment from an employer (verifiable) with a start date no more than 120 days from the date of the HFS contract. • Monthly income sufficient to cover current obligations, living expenses and the vehicle payment. For well-qualified clients, subject to approval by HFS. Offer excludes Clarity. Only one 500 Honda College Graduate Bonus per vehicle. Offer cannot be combined with Zero Due at Signing Lease Program. Offer not valid on Honda Certified Used Car or used vehicles. Offer valid through March 31, 2020 and may be terminated at any time. In appreciation for your military service, Honda is offering select U.S. Military individuals and their spouses $500 toward any 2018 or newer model year Honda automobile when you finance or lease through Honda Financial Services® (HFS) . • Active Duty U.S. Military (Army, Navy, Air Force, Marines, National Guard, Coast Guard and Active Reserve) and their spouses. • Active Duty U.S. Military Ready Reserve (Inactive National Guard, Individual Ready Reserve, Selected Reserve) and their spouses. • U.S. Military Veterans who are within one year of separation from active service, and their spouses. • U.S. Military Retirees (Army, Navy, Air Force, Marines, National Guard, Coast Guard and Active Reserve). 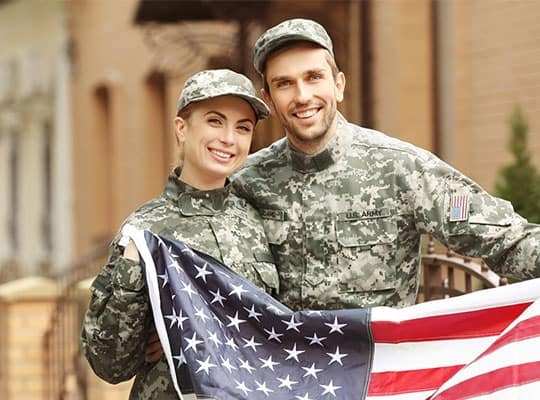 • Spouses of U.S. Military Retirees (Army, Navy, Air Force, Marines, National Guard, Coast Guard and Active Reserve) who are within one year of separation from active service. • Provide Leave and Earnings Statement (LES) as proof of military status or active service at the time of purchase or lease. • Spouses of a member of the U.S. Military must provide proof of relationship by presenting a Military ID, and provide their spouse’s LES. Only a copy of the LES will be retained by the dealership for verification. • Receive credit approval through Honda Financial Services. For well-qualified clients, subject to approval by HFS. Offer excludes Clarity. Only one $500 Honda Military Appreciation offer per vehicle. Offer cannot be combined with Zero Due at Signing Lease Program. Offer not valid on Honda Certified Used Car or used vehicles. Offer valid through March 31, 2020 and may be terminated at any time. NOTE: During the term of the retail installment finance contract or lease with Honda Financial Services, buyer may not take their vehicle outside the United States without prior written consent of Honda Financial Services. During the term of the retail installment finance contract or lease, buyer must notify Honda Financial Services immediately of any change in buyer's address.